A great addition to many baits from crankbaits to jerkbaits and more. Add these flashabou tied trebles to your favorite bait to give them added fish triggering qualities or simply to help create a larger profile without the added weight. 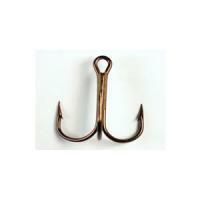 The 35656BR hook is a bronze, short shank, round bend treble, 2X strong.